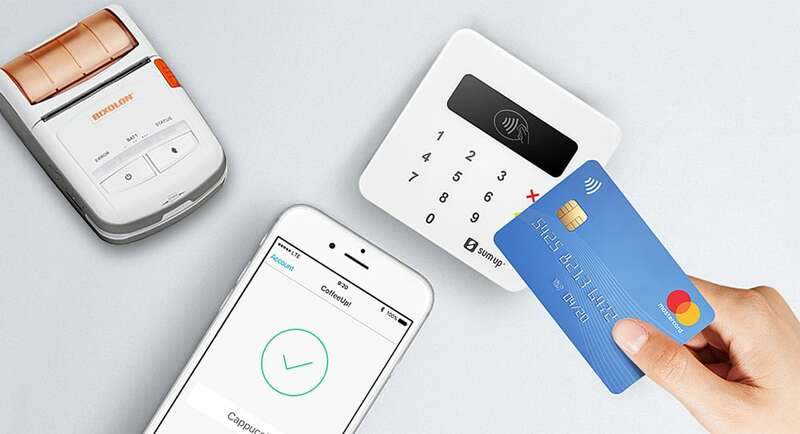 SumUp Ireland review: hassle-free card reader for businesses? SumUp’s app-based card reader can take contactless and chip and PIN payments for just a flat-percentage rate. 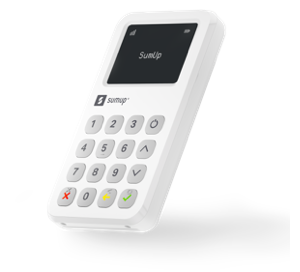 SumUp offers an affordable and hassle-free solution for small businesses and sole traders who need to accept credit and debit card payments. Its Air card reader is a fixed-rate pay-as-you-go solution with no contract or monthly fees. Highs: Fixed transaction percentage for all cards including Amex. No contractual lock-in or monthly fees. Lows: App features limited. No evening or Sunday support. Buy if: You need a hassle-free and affordable solution for taking card payments. MobileTransaction readers can get a SumUp Air card reader for €19 instead of €39. No monthly fees or contract to worry about. Affordable flat 2.75% transaction fee. Free delivery in 3-5 days. Mobile Transaction is an independent payments industry resource trusted by over a million small businesses annually. Many Irish entrepreneurs are looking for alternatives to a traditional card machine that comes with ongoing fees and contractual lock-ins of 18+ months. The contract-free SumUp fits this bill exactly. SumUp Air is one of the few app-based card readers in Ireland working in conjunction with a smartphone or tablet app. 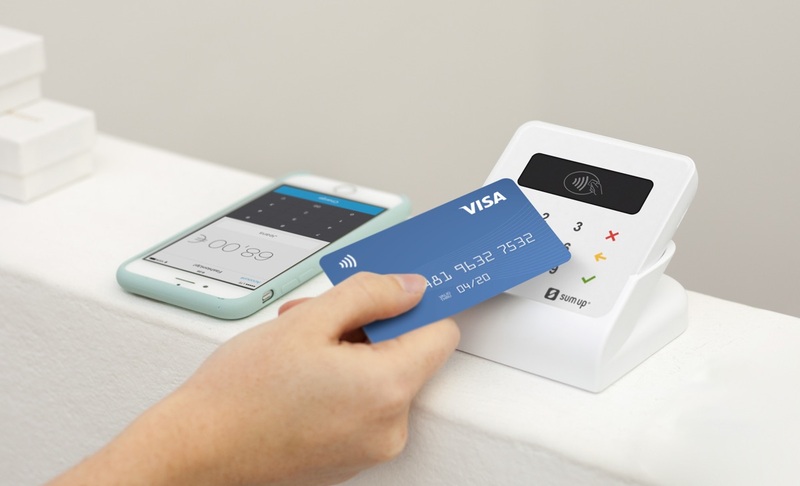 The Bluetooth-connected mobile device only needs to be connected to the internet via WiFi or a 3G or 4G network connection, and then you can take card payments anywhere through the terminal. There are no fixed monthly fees or minimum transaction volume – instead, SumUp is pay-as-you-go service, costing only a fixed transaction percentage for the sales you make and the one-off cost of the card reader, which is yours to keep indefinitely. The cloud-based processing power of the SumUp app is what allows the card reader to process payments. The payment process itself is simple: firstly, key the transaction amount in to the SumUp app. 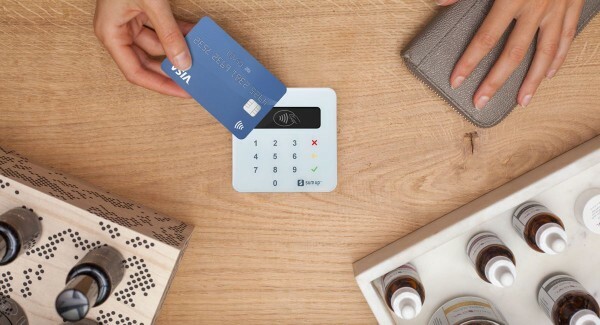 The customer inserts their card into the reader and confirms the payment with their PIN on the card reader keypad or tap their contactless card or phone on the SumUp Air display. When the payment has gone through, you can send an email or text receipt to the customer. SumUp Air accepts Visa, V Pay, Maestro, Mastercard, American Express, Diners Club, UnionPay and Discover. Usually, you have to pay higher fees to accept the last four, but this is not the case here. SumUp also accepts contactless cards as well as Apple Pay and Google Pay. It typically takes 2–3 working days for payments to be credited to your bank account. 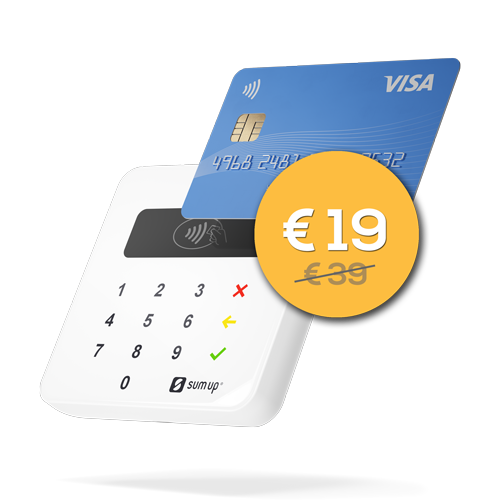 SumUp’s rate is 2.75% per transaction and the card terminal costs €39 + VAT (available for €19 + VAT through this link). The terminal has a 30-day-money-back guarantee from the day of purchase. While some acquirers charge for processing refunds, SumUp does not. Should you need to process a chargeback, this will cost you €10. Also bear in mind that you need to use a phone or tablet with WiFi or network data which you pay for separately. These are all the costs you pay to be able to take payments with credit or debit cards. It is also possible to activate a SumUp Virtual Terminal in your account, subject to approval by customer support. These transactions cost 2.95% + €0,25 each. SumUp’s transaction fee appears to be the best fixed rate currently available in the Irish mobile card payment market. Elavon MobileMerchant used to advertise a transaction fee of 2.75% as well, but they are no longer transparent about this. High-volume merchants might find better deals with a traditional card machine. The SumUp app has the essential features for accepting and managing your payments, and a bit more. For example, add products to a product library for an easier checkout experience as you can click on these to add to the shopping cart. Alternatively, enter the sales total directly in the app when you take the payment. You can create multiple staff accounts in the app, defining whether they are allowed to process refunds and view all transactions in the app. If you need to have more than one person accepting card payments at a time, it is possible to link more than one card reader to the main SumUp account. SumUp’s online dashboard provides an overview of important sales statistics. You can also access sales data and export an entire sales history – or history of a particular day, week or month – to an CSV/Excel file. Payout reports are automatically emailed to you for every settlement in your bank account (if you have the setting switched on), listing the associated transactions. When ready to expand your checkout features, it is possible to upgrade the software to a more feature-rich SumUp Point of Sale, built around your requirements. SumUp 3G card reader or SumUp Air? Last year, SumUp launched a new card reader, SumUp 3G. It has an inbuilt SIM card with unlimited data, so it works independently as opposed to SumUp Air that requires a connected mobile device for payment processing. The 3G model is ideal for those needing an extra card machine to supplement their point of sale, or those on the go preferring a standalone device for card payments. Having a phone, iPad or similar on hand is not for everyone – SumUp 3G solves that problem. SumUp 3G doesn’t accept Diners Club, UnionPay or Discover like Air does, but V Pay, Mastercard, Maestro and Amex are accepted at the same transaction rate as Air. Receipts are sent by email or text message, but paper receipts can be printed through compatible printers purchased in addition to SumUp Air. The only stationary option confirmed by SumUp is the high-performing Star Micronics TSP143 (WiFi), costing around €429 + VAT. Compatible portable options are Bixolon SPP-R200lliK and R210iK and Star Micronics SM-L200. These connect to your smartphone or tablet via WiFi or Bluetooth. If you’re using the card reader with an iPhone or iPad, the MFi version of the Bixolon SPP-R200II is a great choice. It is a rugged, yet lightweight (at 236 grams), portable printer that can either be fixed to a belt or slid into a bag. Prices of these printers are in the range of €210-€330 + VAT. It is also possible to connect the SumUp app to printers using AirPrint (iOS) and Google Cloud Print (Android). SumUp Air with app and Bixolon SPP-R210i receipt printer. To contact customer support, email is encouraged, but you can phone them between 8am and 7pm on weekdays and 8am-5pm on Saturdays. They are unavailable for support on Sundays and in evenings past the opening hours. The email support is generally responsive, but non-urgent email queries may take a few days for a response. The online Support Centre answers the majority of user questions. Apart from that, the product is designed to be so simple to use that very little input is needed from the customer service team. Who is SumUp suitable for? 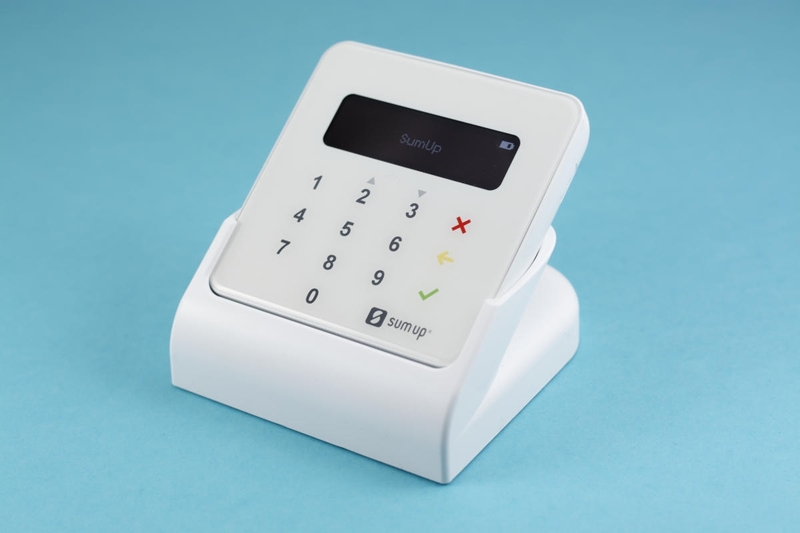 SumUp is a great option for merchants and small businesses needing a single mobile card reader, as opposed to multiple readers and staff accounts. For lower-volume traders and businesses, the flat fee is competitive. If your monthly card sales exceed €5000, it may be worth getting a quote from a traditional terminal provider to compare. Just bear in mind the additional monthly fees, contractual lock-in and minimum transaction volumes that other such providers often require. SumUp is for registered businesses and sole traders only, meaning only bank accounts in your business, sole trader or organisation’s name are accepted. If you’re travelling to trade shows, for example, SumUp offers the flexibility of use it abroad – as long as you’ve alerted customer service, and only if you’re going to one of the other countries SumUp operates in. You register for a SumUp account online through a short online form, then order the card reader which will be delivered to you by post within a week’s time. It is not possible start accepting payments before you have the card reader, but because the account is created immediately, the postage time is the maximum you should wait to get started. As with other payment providers, SumUp performs an automatic identification, bank account and business check upon registration to be sure your details are legitimate and your business is not classed as high-risk. As a self-employed person, your bank account can be in your own name; if registering a business name, the bank account should be in your business’ name. When you have the card reader, download the company’s free app on your iOS or Android device and pair it with the terminal via Bluetooth (needs to be enabled on your mobile device). That’s it – when all of these things are connected, you are ready to take card payments. 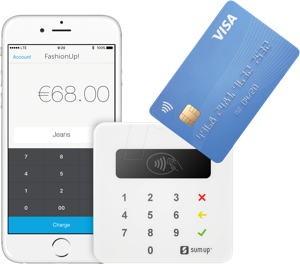 In terms of offering, SumUp is the best option for mobile app-based card payments in Ireland right now. The only similar card reader is Elavon’s MobileMerchant, which has not properly caught on yet. AIB- and Eir-branded Pogo Payments used to offer a mobile card reader too, but they have stopped accepting new customers, and then you have Clover terminals which are not exactly cheap. Small-business merchants will find SumUp’s simple fee structure and point-of-sale app just what they need for accepting cards in the most user-friendly way possible. The card machine is a robust piece of engineering that looks good and fits into your pocket easily. Overall a very low-risk, easy payment solution for anyone who just wants to take payments without hassle.